Designed to take full advantage of the connective possibilities of the web for dispersed conversations, this cMOOC (Connectivist Massive Open Online Course) was underpinned by Rhizomatic Learning, an approach based in the work of French philosophers Deleuze and Guattari. It takes their view of knowledge as resilient, alinear and uncertain and applies it to the learning process. 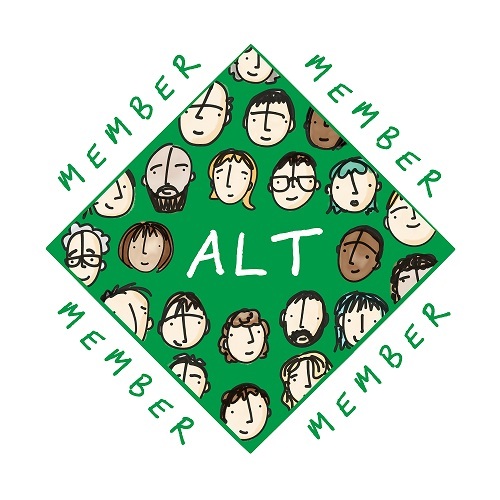 This participatory view of learning has the advantage of allowing multiple narratives to exist around a given theme, while constantly running the risk of being taken over by dominant voices that exists in any online learning community. The goal, inevitably, was to make the community the curriculum. This course was run under no official educational affiliation with no VLE (Virtual Learning Envrionment) platform. The starting date was announced on Twitter and participants were encouraged to monitor the hashtag or sign up for the newsletter. Each week’s theme was accompanied by a challenging question or prompt that was meant to get a certain kind of conversation started. A challenge for the week (e.g. “build learning subjectives”) was posted on http://rhizomatic.net and sent out via email newsletter, Twitter and Facebook group. There was no requirement for participants to ‘sign up’, and it was frequently seen during the course that participants who were most active had either not signed up for the newsletter or never opened the email. 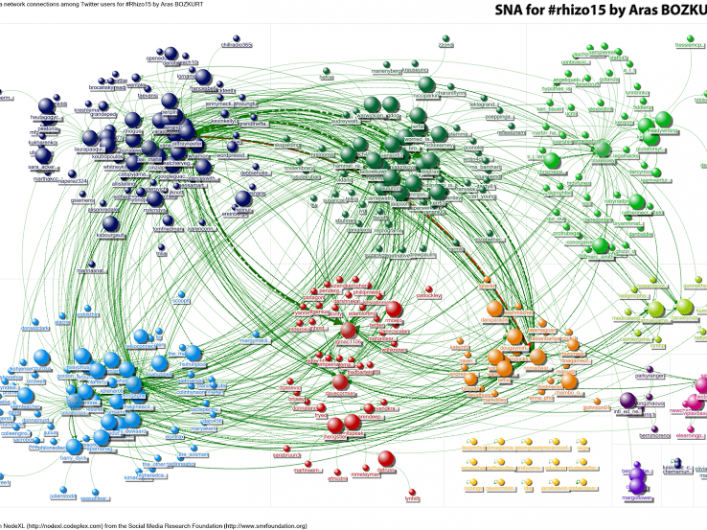 Communities formed around the hashtag #rhizo15, but clusters also appeared along different themes and affinity groups, from participants who were more research oriented to those who were interested in creating artistic responses to the prompts. The response to each prompt, whether a blog post, a Twitter/Facebook conversation or elsewhere online, became the locus of conversation. Comment activity on blog posts fluctuated weekly during both #rhizo14 and #rhizo15 and is difficult to measure on the open web. 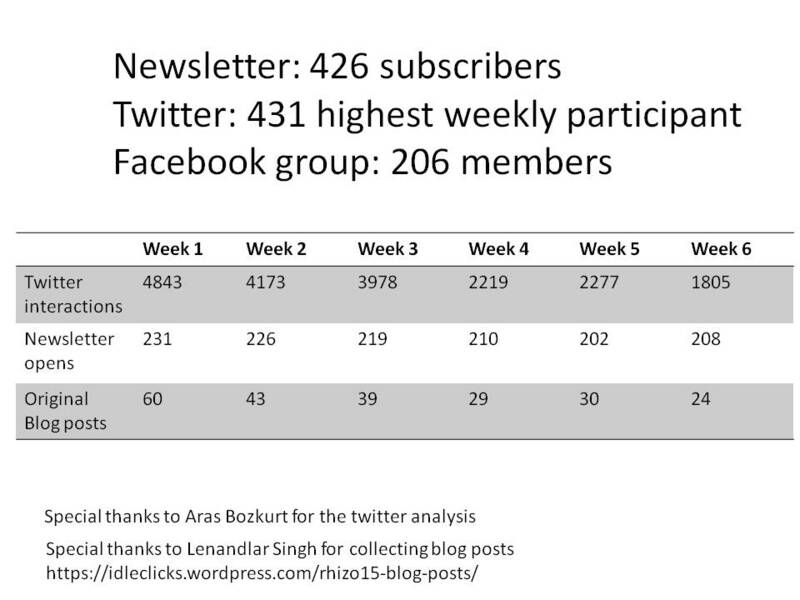 The Twitter activity level was quite high compared to the number of Newsletter opens (out of 430 registrants). The themes are current research interests of mine and chosen as a response to conversations contributed by the community. Only the first theme was decided upon before the course began, and each following theme emerged from the process – though they each represent conversations that are inevitable in a rhizomatic approach to learning. 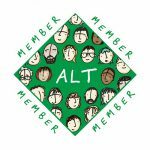 As facilitator I focused my efforts on curating the community itself by encouraging participants who appeared confused or frustrated, providing a midweek update, and amplifying contributions that were of specific interest by retweeting. The quality of the posts and the range of the discussion is the real magic of a course like this. If I were to limit a conversation to the things that I know as a facilitator I narrow the scope of possibilities dramatically. I would also posit that the opening up of the power conversation in learning to allow the participants to be the curriculum has the possibility to allow much stronger and more resilient affinity ties to create themselves. Rhizomatic learning performed in this kind of open participatory way could be a terrible way to teach people their times tables. It is certainly possible to do online learning or MOOCs that are rote and driven by the instructor by watching videos and answering multiple choice questions. It is, however, a powerful tool for learning in complexity and for a distributed network community of learners that you can learn with and from. 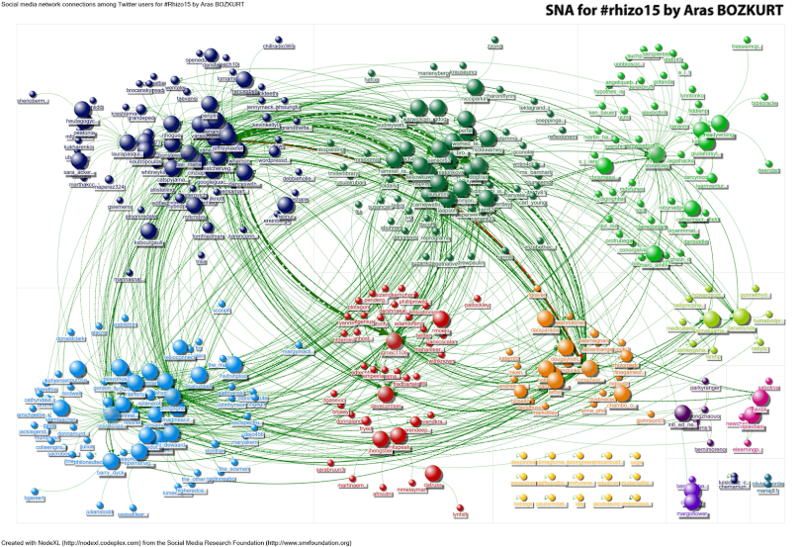 This graphic represents Social Network Analysis (SNA) done for the #rhizo15 tag on week two by one of the participants. As facilitator, I am shown as the red dot in the lower part of the middle of the diagram: important, certainly, but in no way central to conversations happening around the #rhizo15 tag. *A draft of this article stimulated debate among co-participant editors about the role of facilitation in a CMOOC. Curation is twofold: (1) promoting access to the conversation via different channels and (2) sustaining a perpetuation of online dialogue, which may be achieved by highlighting aspects of the conversation. This may be problematic if centred around an individual hub, or figure, though it’s necessary to ensure conversation continues and salient points are amplified. It was felt valuable that the central hub withdraws from the discussions and there is also the option for multiple facilitators, or changing curator frequently.